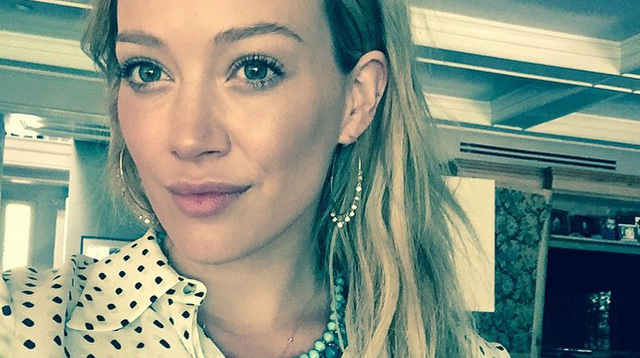 "I didn't feel like I was playing a part..."
Hilary Duff gave an incredibly candid interview to PrideSource in which she got really real about what it was like to star as the titular character in Lizzie McGuire, the Disney channel show that rocketed her to stardom in 2001. And while many of us love Lizzie as if she were our own obnoxiously fabulous sister, Hilary had more of a complicated relationship with the iconic character. "As torturous as it has been at some points in my life to be Lizzie McGuire, I think that when that show came out, it was such a part of who I was, I didn't feel like I was playing a part," she said. "The writers all knew me so well and were writing things that were happening in my life and things that I would say, and I was dressing exactly like I wanted. It was so me." Because she was so closely related to the character, she "chose to bow out for a minute" before making her next big move. "Everyone thought I was just absolutely nuts because I was really successful and making a lot of money," she said. "And it was scary, because there was no guarantee that my career was still gonna be there." Fortunately for all of us, Hilary's career is still going strong—she's staring on TV Land's Younger and has a new album, Breathe In. Breathe Out., coming out soon. And we are all the better for it because Hilary Duff is pretty much the best.